The Silo is the world, the whole of civilisation – a protection from the deadly outside. Those who don’t agree will be sent to clean. Wool is a five part story set in a post-apocalyptic world where the outside atmosphere is poisonous and a large underground silo has held humanity for hundreds of years. Let me start by saying the first part of this story was one of the best that I’ve read for a long time. It was a surprising introduction to life in the Silo through the eyes of its sheriff, Holston, as he chooses a course of action which haunts the rest of the story. It is through this character that we’re introduced to the concept of cleaning. 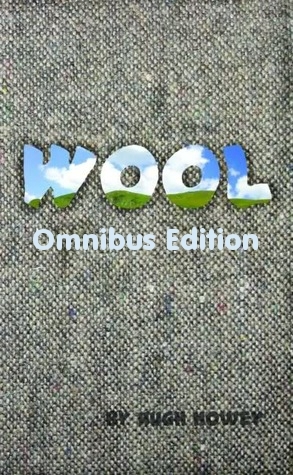 By the end of part one, we know that Wool is set not only in a post-apocalyptic world but also in a dystopian society. It’s not actually until part three of the book that the main character comes to the fore but by then we’re already seeing the ripple effect of Holston’s decision as we’re further briefed on life in the Silo. We also meet some of the other major players in the drama that follows. As we progress, it won’t be surprising to find that the false utopia of the Silo is upset along with some occasionally startling revelations about different characters, their motivations and the history of the Silo itself. But I think it would be unfair to go much further than that in this review as I found the unwrapping of this gift so enjoyable that I would not want to spoil it for anyone else. I will summarise by saying that the tension built progressively, the revelations seemed to occur right on cue and the action scenes in the real “meat” of the drama left me sufficiently breathless and clicking the page turn button in anticipation. It was a really great read. The characters in this book were well developed. Even relatively minor players seemed to be fleshed out more than I would have expected. It was easy to become invested in Juliette, the protagonist. I felt that I knew her. Her strong sense of duty and her tough, analytical mind tempered with an emotional depth made her easy to root for. But I also felt very familiar with Bernard. As head of IT in the context of the Silo he had some huge responsibilities and I believe I could appreciate them. I didn’t picture him as a power-hungry dictator that I needed to despise, but rather a tortured soul who bore the weight of knowledge and responsibility that others could not guess. I did feel right at the end that there was a slight inconsistency in his actions and I was a bit disappointed that this tainted my view of him somewhat, but it was a small thing and the scene itself was impressive enough that it didn’t even occur to me until sometime afterwards. Rather than perform the same task of describing each character, let me finish by saying that for most characters introduced, I ended up with a clear picture of what they looked like and could almost see their expressions and actions as if watching a movie. I believe the author worked hard to give life to this cast. The prose in Wool flows well, leaves me with a fairly vivid picture of settings, actions and characters and is almost entirely error free. I never found myself wanting to change phrases or re-imagine sentences to remove awkwardness. The language itself is not overly sophisticated, but neither is it too simplistic. In fact, the best compliment I could pay is that the prose itself seemed to vanish almost entirely as I progressed through the story. The author seems intent on adding to the world of Wool with future stories and novels and I embrace that decision and look forward to more adventures. I’m now going to quickly praise myself for not gushing during this review (a fairly strong temptation) and finish by saying that if you like dystopian/post-apocalyptic fiction, you should be purchasing this now and moving it to the top of your list of required reading. I don’t think you’ll be disappointed. This entry was posted in 5, Novel, Reviews, Science Fiction and tagged Dystopian, Post-apocalyptic, Science Fiction. Bookmark the permalink.